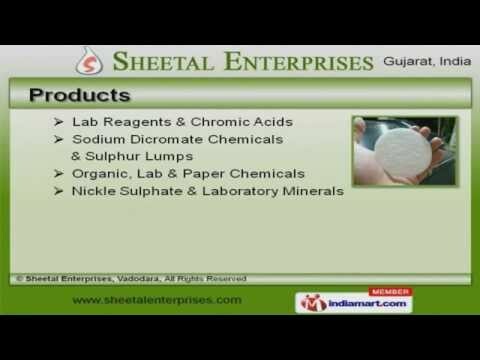 Welcome to Sheetal Enterprises, Manufacturer and Exporter of Mineral Powders. The company was established in 2003, at Vadodara. Our products are applicable in Steel, Textile and Cosmetic industries and we cater to Indian Subcontinent. Our client list includes Surya Chem Private limited and Lencos Chemical and we are supported by Hygienic & safe packaging. We offer a wide array of Organic, Lab and Paper Chemicals. Our Lab Reagents and Chromic Acids are best in the industry amongst others. Sodium Dicromate Chemicals and Sulphur Lumps offered by us are a class apart. We are able to offer a exclusive range of Organic, Lab and Paper Chemicals. Along with that we offer Nickle Sulphate and Laboratory Minerals that are widely acclaimed in the market. We also provide Chemical Powders and Hepta Zinc Sulphate that are some of our best selling products.